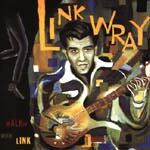 Walkin' With Link collects the sum total of Link Wray's sessions residing in Epic's vaults. Epic didn't release an album, so the tracks that were released were single only and in mono. The balance of the disc are stereo remixes, plus some perviously unreleased tracks. Like every Link has recorded, there's magic in these tracks. Link Wray is just about the only player who can create very simple riff rock and make it shine. Susan and the SurfTones recreate this classic Surf Raiders tune in their own image, with distortion and bite. They retain the feel, with the tribal island drums, melody, and organ backing, but the guitar tone brings it a much more intense appeal. The more I listen to this, the better I like it. Great interpretation! Man oh man. Tribal drums, groovin' cool cats bass, and drivin' distortion guitar. Cozy Cole had a major Billboard hit with "Topsy Part Two" in the late fifties. His release is a splendid blend of big band and rock, and is very infectious. I've long thought it should be reinvented as a surf tune. Susan didn't exactly surf it up, but this rocking groove proves the rockability of the tune, and hints at its surfability. Very good listening. The retention of Cozy Cole's drum licks is a must, and the restraint with which they are played helps transfer the drive from drums to guitar, without undoing the power, and while enhancing the "cool" factor. Country chumpin' barn dancin' twango riffs and a sense of humor permeate this excellent basic RI track. Images of plaid clad two-steppers take flight from this warm track. A stereo remix. Previously unreleased. With extra cool cow bell action, this is another variation on "My Beth" / "Studio Blues." This stereo remix brings the percussion into a particularly supportive role, while Link's guitar warmly plays with inviting distortion. It's hard to back away from this track. The track fades quickly at the end. Previously unreleased. Susan and the SurfTones tribute to the spaghetti western genre is more than a little nice. Round guitar tone, with a whistling organ underneath, and great cowboy drums are all here. This is written by Buck Malen. The big boom reverb of the toms is very dramatic and super cool. Not quite of the Hellbenders' caliber, but damn close. I like this a lot.